Klonopin vs. Xanax: What Makes A Doctor Prescribe One Over The Other? This entry was posted in Substance Abuse and tagged Misuse, Prescription Medication, Signs and Symptoms, Treatment on August 18, 2016 by Team Addiction Hope. Klonopin and Xanax are two of the most commonly prescribed medications for the treatment of anxiety, and both belong to the drug family known as benzodiazepines. These drugs work by suppressing the central nervous system and effecting GABA (gamma-aminobutyric acid) in the brain. The result is slowed nerve impulses and a powerful calming effect. The different pills, however, offer unique results and doses. It’s important that doctor prescribe the proper choice to deal with a patient’s specific issues. And, of course, not everyone has the same reaction. However, there are general guidelines for each medication that apply to the majority of patients. Xanax, generically known as alprazolam, was one of the first medicines dedicated to treating panic and anxiety disorders. It is the most common drug prescribed for people who suffer from generalized anxiety disorder (GAD) or social anxiety disorder (SAD). Xanax is a very fast-acting drug, but it does not tend to create the lasting effects that Klonopin and other benzos do. In fact, alprazolam may need to be taken multiple times in a day to achieve consistent results and symptom relief. The exception is, of course, extended-release tablets. In general, doses of Xanax are very small, but can be raised if necessary. There are many potential side effects when taking alprazolam. However, most are mild and easily accepted by patients for the relief they provide. The greatest risk of taking Xanax, however, is addiction or dependence. People with history of drug abuse should not take Xanax, and it is very unsafe to use with alcohol. The higher the dose and longer the period of use, the more likely a patient will form a dependence on the drug. A prescription Xanax user should discontinue use with the guidance of a doctor. Klonopin is widely used as a treatment for panic disorders, but it has several other uses as well. Tourette’s syndrome, epilepsy, seizures, psychosis and restless leg syndrome can all be addressed with the pill. Because Klonopin is an anticonvulsant, it may also help people going through alcohol withdrawal. The chemical name for Klonopin is clonazepam. It works a bit slower than Xanax does, but it provides a longer-lasting effect. It also enters and leaves the bloodstream more gradually, which makes it slightly less likely to cause dependence and addiction. Unlike Xanax, clonazepam is only available in two forms: The tablet is the most commonly prescribed, but the dissolving wafer may be favored among patients with acute anxiety. Again, doses are small to begin with, but can be increased incrementally. 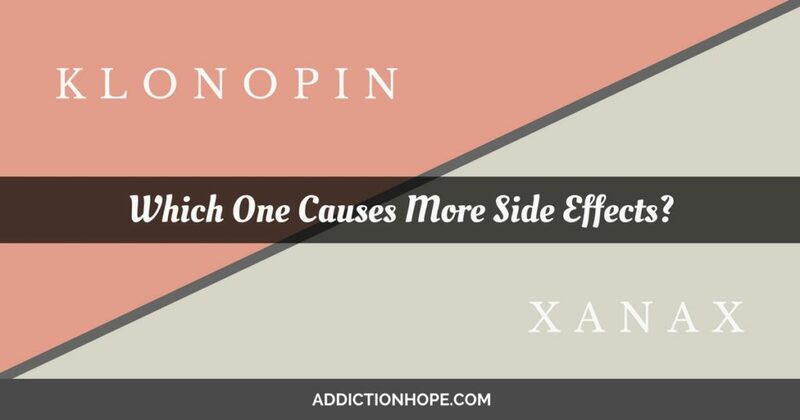 Although it causes fewer symptoms, Klonopin is not any less addictive than Xanax. Again, anyone with a history of substance abuse or dependence should avoid taking the drug. Alcohol should be avoided, because combining the two can lead to dangerously slow breathing, similar to alcohol’s interaction with Xanax. Klonopin withdrawal is equally unpleasant. A paradoxical effect can take place where the withdrawal exacerbates the very symptoms the drug was preventing. A patient under treatment for GAD, for example, may have panic attacks as Klonopin is flushed from their system. As in the case of Xanax, seizures pose the greatest threat, and extreme cases can result in death. Any time you’re attempting to discontinue benzodiazepine use, it’s very important to do so with proper medical supervision. These drugs are powerful, and they affect the way your entire brain and central nervous system work. The weaning process must be gradual to avoid dangerous reactions and minimize the unpleasant side effects. Struggling with addiction to these substances can make sufferers feel hopeless, but it doesn’t have to be that way. Help is always available. It’s also important to watch for symptoms of abuse among friends and family members. Talking to them and providing support is the first step in finding assistance for them. How would you help a loved one trapped by addiction to Klonopin or Xanax? Please comment below.